The earrings in this category date from circa. mid 1900's vintage pieces, retro, 1950's to previously owned contemporary estate earrings. 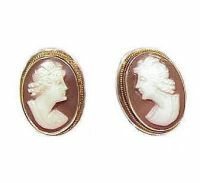 Featuring vintage 10k & 14k gold earrings, vintage sterling silver earrings, cameo earrings and more.